Apple has implied that the iPhone 5 is bending the laws of physics and it turns out when it comes to the battery, that claim isn’t far from the truth. The battery inside the iPhone 5 has a capacity of 1440mAh at 3.8V, which equals 5.45Wh, compared to the 1432mAh, 3.7V, 5.3Wh of the iPhone 4S. This, coupled with the nicely optimized software, produced some truly impressive results. Talk time on the iPhone 5 was quite impressive, reaching 8 hours and 42 minutes – far from the top spots but pretty good nonetheless. Given that the official iPhone 5 specs suggest a maxim talk time of 8 hours, we were nicely surprised by the performance of the iOS smartphone. The iPhone’s Mobile Safari browser offers no Flash whatsoever and relies only on HTML5, which is far less taxing on the battery. The iPhone 5 set the new record here, only 4 minutes short of 10 solid hours. It got 40 minutes more than the Motorola RAZR MAXXX, which is an impressive feat indeed. And finally we get to video playback. The iPhone 5 is at an advantage here as its videos are converted to the mov format, but it managed to beat the iPhone 4S’s achievement of 9:24 hours by nearly a full hour, so its chipset should really get some credit, too. 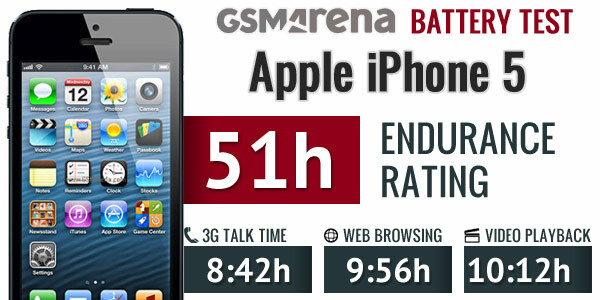 Finally we come to the Apple iPhone 5 endurance rating and we got a mind-blowing 51 h score.This means that you will only need to charge your iPhone 5 once every 51 hours if you use it for an hour of web browsing, an hour of video playback and an hour of talk time per day. 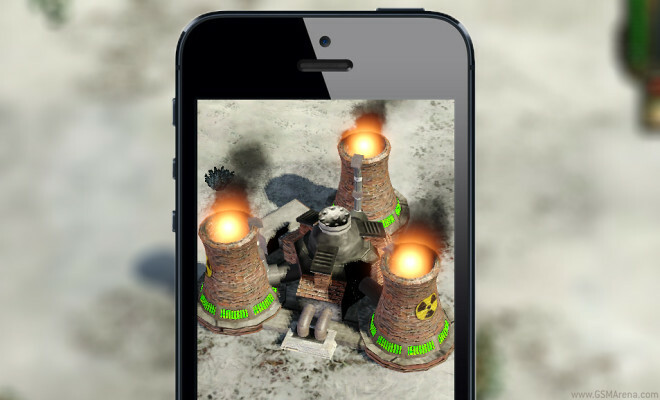 When it comes to battery, the new iPhone 5 is definitely a solid step over the iPhone 4S. Retaining the same results as its predecessor would’ve been a great achievement considering the new more slender body of the iPhone 5, but doing even better, despite the larger screen is even more impressive. If you’d like to see what else the iPhone 5 has over the 4S you can check out our dedicated review here.